Alfaisal University Engineering students and faculty attended the Stanford University Space and Aeronautics Workshop at the King Abdulaziz City for Science and Technology (KACST) on Sunday 26 October 2008. The distinguished speakers from Stanford University were Professor Robert L. Byer (7th from LHS) who is the HEPL Director and the William R. Kenan, Jr. Professor of Applied Physics; Professor Charbel Farhat (2nd from RHS) who is the Vivian Church Hoff Professor of Aircraft Structures and the Chairman of the Department of Aeronautics and Astronautics; Professor C.W. Francis Everitt (6th from LHS) who is a Research Professor at the W.W. Hansen Experimental Physics Laboratory (HEPL); and Professor Blas Cabrera (1st RHS) who is Professor of Physics in the Department of Physics. The scientists were at KACST to facilitate research collaboration between the two institutions. 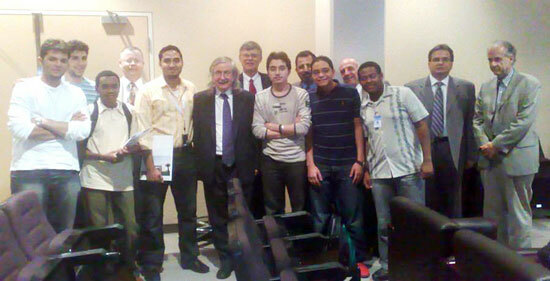 A total of 22 Alfaisal faculty and students attended the event. Alfaisal Ukniversity has an agreement with KACST to foster research collaboration with faculty as well as encouraging students to use their facilities. This was a great opportunity for Alfaisal faculty and students to hear from and to interact with some of the world’s leading researchers and educators in space and aeronautical engineering. It was particularly interesting to see how Stanford University faculty have reached out to students at all levels (i.e. high school, undergraduate as well as graduate) to challenge them with practical research problems that require innovative solutions. This is the same student-centered approach that is found in Alfaisal University’s mission and vision.